If you are an experienced sailor and you feel confident about your sailing experiences, we suggest you choose a bareboat charter. Not only you can test your abilities and make yourself feel the master of the seas, this way you can cut your expenses and decide not to hire a skipper. Make your own itinerary and take your family and friends to a journey along the Italian coast. Don't forget you are the captain, thus you take the full responsibility for navigation and for safety of your passengers. 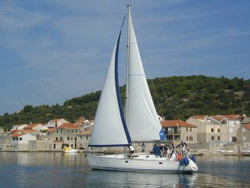 Chartering a boat without a skipper has become more popular recently. People are eager on activities and this is the best way to show the best and try something completely different from your everyday duties and obligations, provided that you have some experience of course. It is the great challenge for all. Besides experience, you need the international certificate of competence in navigation and the VHF permit for reasons of safety. Once you decide to charter a boat without a skipper, you will meet a great choice of boats for charter in Italy. However, not all of them can be chartered without a skipper. In that case, ask for an advice or let your charter company make some suggestions according to your needs.